Date is a guess - will get an update from Catherine. Catherine says:- This is my Grandparents wedding photo taken outside Burnside at the corner of the old bewery. 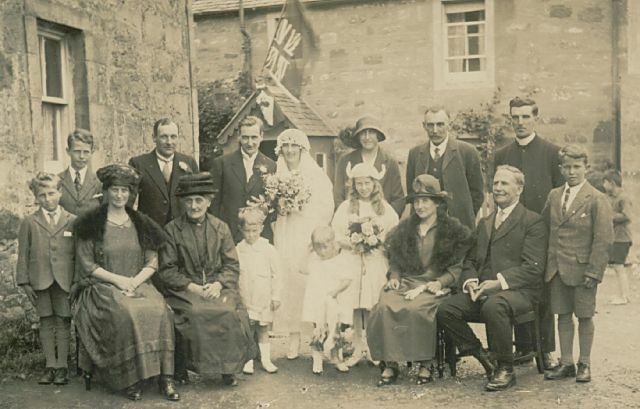 Seated left to right are Margaret (Maggie) Urquhart, Mrs Taylor, groom's mother, Isobel Urquhart, bride's aunt, Robert Urquhart, bride's uncle. Standing left to right. Fergie and Edwin Urquhart, Jim Taylor, groom's brother, Davy and Lilah, Mrs Moore? ? Thomson relative of the Taylor's, Mr Moore, minister? Magnus Urquhart. Making up the bridal party, page boy Victor Urquhart, flower girls Margaret and her older sister Rhoda Urquhart. I think the year was 1924/25, but no later than that. My granny's mother was Louisa Urquhart, she married a Robert Clark from Methil in Fife. Hello, I stopped at the name Taylor! My Gt Gt Grandmother was Jane Taylor b 1837 Dorres Inverness married Alexander Reid b 1837 Cromarty They worked at Allerton Farm with their family in 1881 I wondered if they were related ? My grandmother was a Margaret Urquhart, married to William K. Urquhart-later moved to Tain. Wondering if it is her? Later had children, Peggy, Rex and Thomas(my father). picture #841 is almost identical, but with a few additional faces. Is that Aunt Rhoda with the horns on her head... Hello all. Mum once told me that was Donny Taylor in the background without the shoes. My grandfather was Gilbert Magnus Urquhart, brother to Rhoda, Victor and Fergus. I think my grandfather is pictured on the right of the picture! My late Uncle was Angus Uquhart Ross born at Invergordon. His parents were John Ross from Invergordon and Florence Hetty. John Ross' parents were John Ross born 1848 and I think Margaret Urquhart who was born in 1864. Their parents were Peter Ross and Catherine Thomson and Alex Urquhart and Ann Smith. Do any of these names sound familiar to anyone.